Are you looking for wooden furniture online at an affordable price? OnlinesofaDesign is the leading manufacturer and supplier of furniture in Mumbai. Our wooden sofa set designs that gives a modern outlook for your dream home. Our sofas are specially made with teak wood or Sheesham wood and high quality material with several designs. 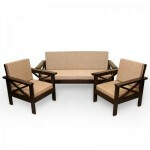 Bringing wooden sofa set, generates an trendy look to your home. Sofas are an essential furniture for any living room, that enhance the look and stylish of any room and elegant you and your guests. See more collections with different styles, colors and materials below wooden sofa set images, we had like to present modern sofas that fits for your home.